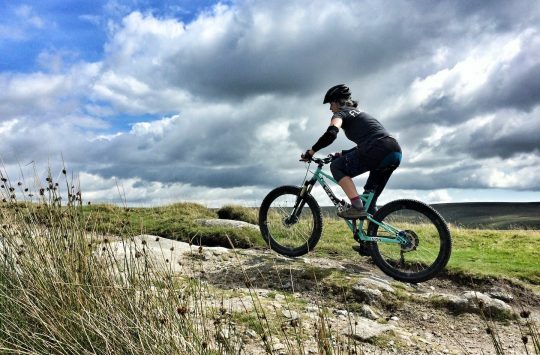 For the weekend of 6th and 7th October, Bike Park Wales opened its doors to women. 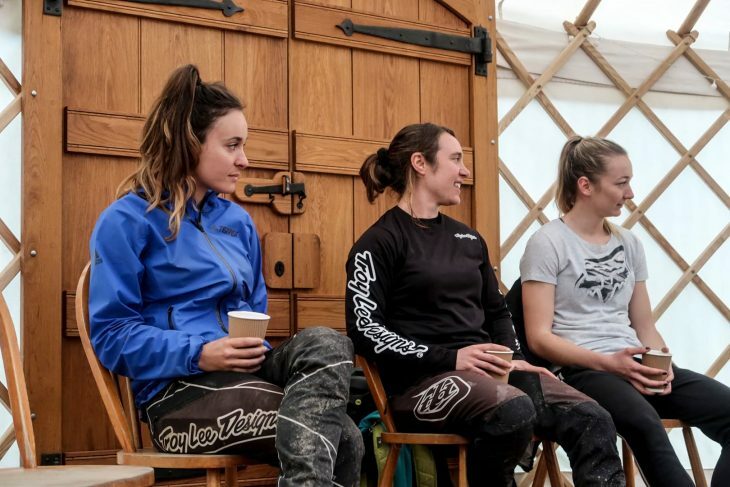 Not that women aren’t usually welcome, but to make sure the park was filled with #RadMums, #girlswhoride and #ladyshredders they were giving women free pedal passes (usually £10) for the weekend, as well as offering a range of additional activities and an event village. Hannah and Amanda headed down to check out the event. Here’s how they got on. It was my first trip to Bike Park Wales, and my first proper experience of an uplift. I usually ride from my house – or work – so rarely venture to bike parks or purpose built bike trails. 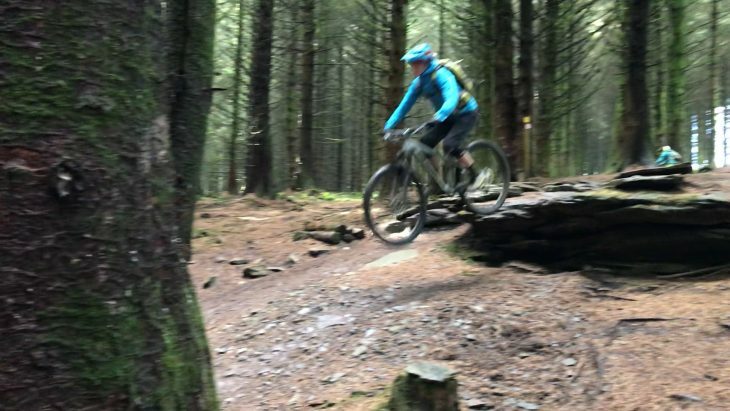 However, after a summer with multiple trips to Leeds Urban Bike Park, I had seen the merits of being able to session and repeat runs in a more predictable trail environment, so was really keen to take on some of the long descents at Bike Park Wales. There were stands and extra food options laid on for the weekend. Amanda had visited BPW before, but not that long after she’d started riding. Since then, she’s learnt plenty of new skills and there have been a number of new trails built, so she was keen to see how both she and the park had moved on. We went armed with a pair of test bikes. Amanda had the Specialized Stumpjumper Expert 29, a carbon fibre beast of a bike with 140mm rear travel and 150mm forks. At £5,000, it’s a well specced bike that Amanda has ridden a fair amount over this summer, as she says it ‘makes her feel like a hero’. I took the fresh out of Fresh Goods Friday Norco Fluid 9.0, an alloy framed 29er with 120mm rear and 130mm front travel. 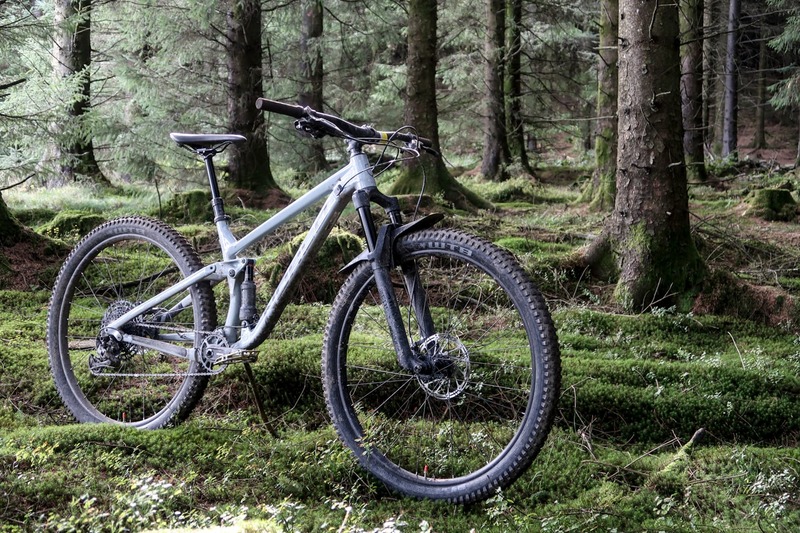 At just £1,850 for a full suspension bike, it’s a tempting looking package and I was keen to get the bike set up and tested. The Norco was fresh out the box. Sendy Panda on the Stumpy. It’s a decent drive from Singletrack Towers to Merthyr Tydfil, so we stayed over on the Friday night in a handy cottage which came complete with bike wash area and secure bike storage. There seems to be a fair amount of this type of accommodation in the area, and it’s worth it to be able to get up in the morning and get a full day in the park. A short pedal round the edge of the town in the morning, and we were entering the gates of Bike Park Wales, where already, even at 9am on a rather wet Saturday, the car park was filling up and riders were queueing to register for the day. 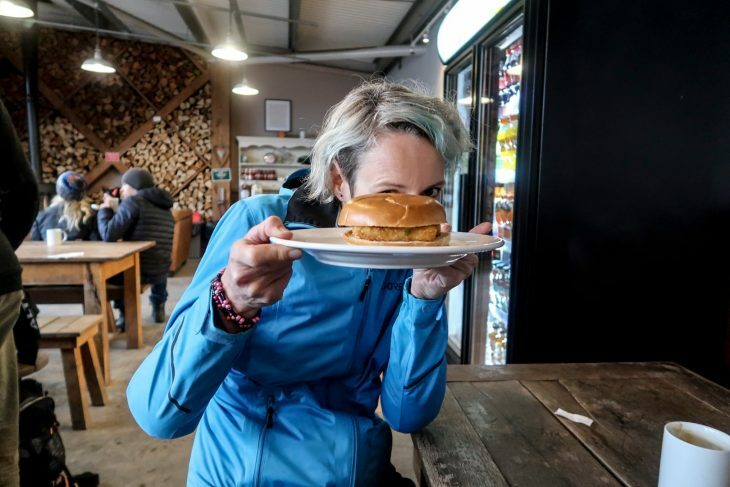 We started both days with hash brown butties. Fuel is important. Although it was the ‘Women’s Weekend’, there were plenty of blokes there to ride too, which gave the day quite a different feel to a lot of ‘women’s specific’ events. It felt good to be specifically welcomed, and to see so many women riding, yet it was refreshing not being made to feel like we were being wrapped in cup cakes and yoga in order to get us there. 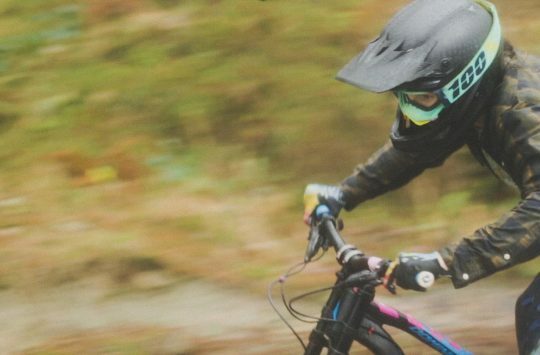 In addition, it is surely good for guys to see women riding and show that we can shred too? For the first run down, we chose to warm up on the fairly flowy blue Terry’s Belly followed by the more jumpy blue Popty Ping. There was a handy little return trail option, so we sessioned the Popty Ping line while I fiddled with brake positioning and tyre pressures, before heading back down the rest of Terry’s Belly to the uplift for another run. Having got my bike set up how I wanted it – a bit less air here and there transformed the ride into one where I felt like I was gripping the trail – we had another run down, this time moving on the red Hot Stepper route. This had some nice little drops at the start which made me feel like I was taking on some manageable but approaching scary drops, before winding along through the woods for a bit. Just as I called out to Amanda ‘this is a bit boring’ a large rock drop appear, much bigger than anything I’d done before. Heading over it more slowly than was required, I just nose bonked my way down it. It was time to get a bit more sendy. Telling myself I knew what to do, this was just a bit higher than anything I’d done before, I launched myself off. Not bad. Maybe a bit more speed, a touch more pop. I feel a bit sorry for Amanda at this point, as despite having ridden it (and indeed bigger things elsewhere), she didn’t fancy sessioning it and had to stand there while I rode it over and over and over and… But I appreciated the video footage she took as it gave me the chance to study my form and try and learn from each attempt. I admit, I felt like a god, even if the video footage suggests it wasn’t as high as it felt, and that I have much work to do on landings. Still, it gave my rear wheel a sound testing. Whee. Too fast for a camera. Pressing on – who knew what fun the trail ahead might hold? – we continued on down Hot Stepper, where it got a distinctly more natural and slithery feel, combining roots and drops in a fashion that had Amanda racing off ahead as I took things a little easier. We were discovering we made a good riding pair: Amanda pushing me on to add speed where I might just have focussed on technicality. Between photo and video shooting and other journo demands, we’d run out of time for any more uplifts, though we’re sure that with a bit less faff and a bit more focus on getting the runs in we’d have ridden until we were very tired indeed. It was surprising just how tired we were – additional squat training might well help build up those muscles less used to standing for such long periods of descending. Knowing we had a second day of riding ahead, and with the weather clearing, we didn’t want to make that mistake of riding until we were over tired, so we got cosy in the yurt and sat down to enjoy a Q&A session with visiting pro riders Tahnee Seagrave, Katy Curd and Vero(nique) Sandler. 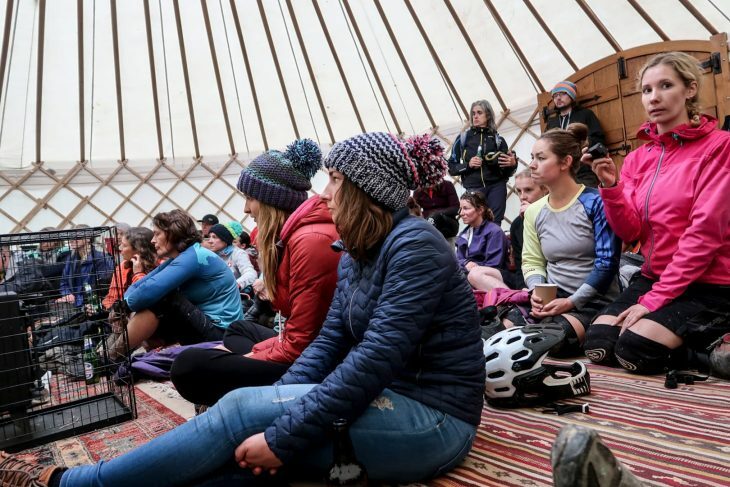 Q&A session in the warmth of the yurt was welcome. Many of the questions were quite racing focussed, although Vero no longer really races, instead focussing on riding for fun. 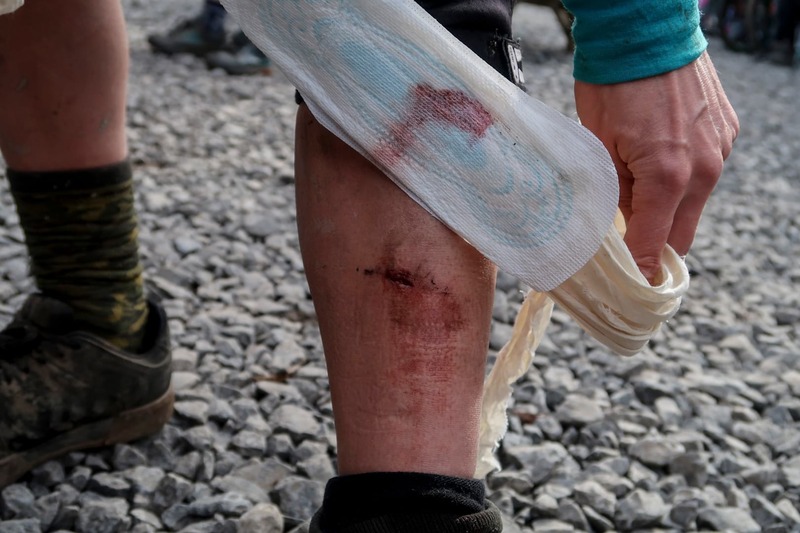 While it was good to see so many women keen to push themselves at races, for me it was more encouraging to hear the honesty of the pros in their approach to riding. Yes, they get scared. Yes, manuals are hard. 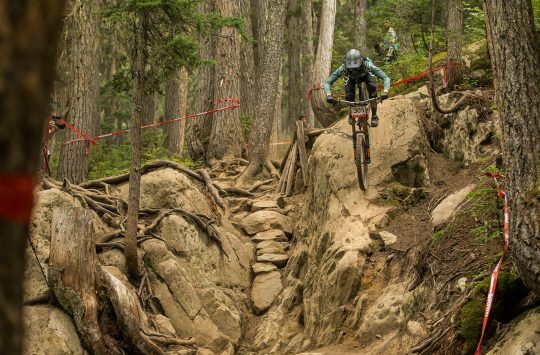 Yes, there are features they’ll avoid if they’re not obliged to ride them as part of a race. No, they’re not following intensive and restrictive healthy eating plans. The session made them seem really human, and like perhaps us mortal riders might be just a different day job away from being as cool as them. Across the weekend there were various opportunities to pay for or just join in with a selection of activities, coached sessions and rides. These were reserved for women, but the trails were open to all as usual. There was a great atmosphere out there, with plenty of not-so-rad guys out too. Maybe this is how things usually are, but we couldn’t help but wonder if there were a few more novice guys who thought that the Women’s Weekend might have been a less intimidating time to venture out. Certainly there was a wide range of abilities and bikes out on the trails. Hardtails were fairly few and far between, but there were plenty of bikes that weren’t sporting any modern standards or long and slack geometry. Despite being much busier on the (much sunnier) Sunday, the trails never felt busy – although there could be a wait for the uplift at times. With no one on your tail shouting ‘Strava!’, no risk of roaming dog walkers, and space and time to go back and try sections again, there was opportunity to push your limits, find them, and go back for another go. I did have a very close call when, riding faster than I usually would, I didn’t have time to get my hands to the ground before my face. It’s an unusual experience as your brain puts all its energy into taking in the fact your face is currently acting as a brake, and that currently the ground is nice and loamy against your lips, and that if that changes then the dentistry is going to be expensive, and that getting your arms out from under you might be quite an important things to achieve before your luck runs out and you run out of soft mud. I was very very lucky to leave that crash with a slightly ripped jersey and barely a scratch on my face. Of course, my full face helmet was in my van. Lesson learnt: trails like this present the opportunity to go faster than natural trails – or even many Forestry Commission trail centres – where land is shared with walkers, dogs, sheep, etc. Next time, I will be wearing a full face helmet, I think I used up my luck. My knee and elbow pads were deployed to full effect, and I’d highly recommend wearing them. Our aim for the weekend had been to feel like we had made progress, and as we took in our final run of the day, down the red graded Vicious Valley and into Rim Dinger, we really felt that progression. Rim Dinger especially, with its many drop offs and rocks, had us whooping. Where previously we might have got down it, instead, we flew down it, at speed, jumping off the drops rather than nose-plopping down them, barely touching the brakes as we went into berms, enjoying that feeling of riding on the edge. It was time for us to go – rather reluctantly, we admit. 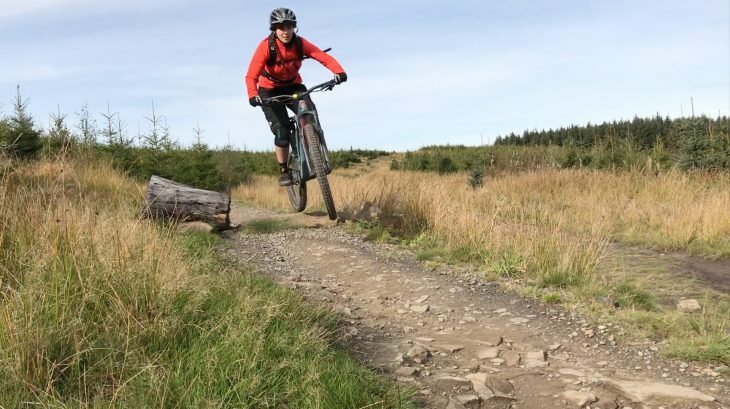 The clear grading of the trails – as well as being graded by colour, there’s a separation between flow and technicality which we found useful in matching to our riding styles – had let us work our way up through features, gradually gaining confidence. 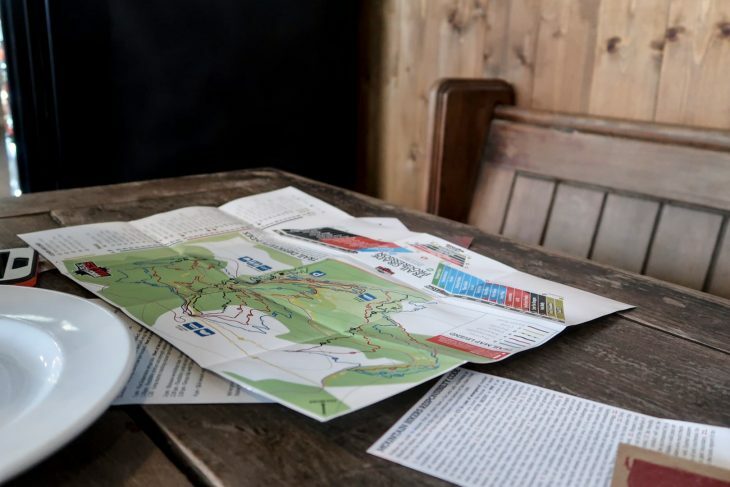 The qualifiers are sensible and genuine – get through the start and you can ride the rest of the trail without any unpleasant surprises, and the trails seemed to us to have decent visibility and opportunities to stop and get off the trail. A number of push or ride back up opportunities also meant that you’re not dependent on paying for loads of uplifts – once you’re up the hill, you can stay there a while rather than having to head straight back down again in one go. All in all, it felt like an ideal place to work on your skills without feeling like you’re getting in the way of anyone. We have more trails to conquer. We’ll be back. 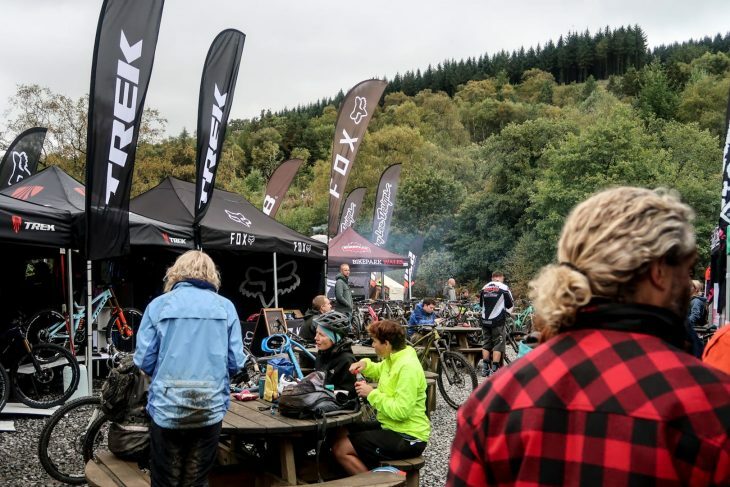 The Women’s Weekend was a great and welcoming way to get ourselves through the gates at Bike Park Wales. I now know I can handle it and Amanda felt much more confident than her previous visit. We’ll definitely be back. Trail access and uplifts were provided by Bike Park Wales. It was a great weekend – personally I think it’d be great to run them a 2-3 times a year. 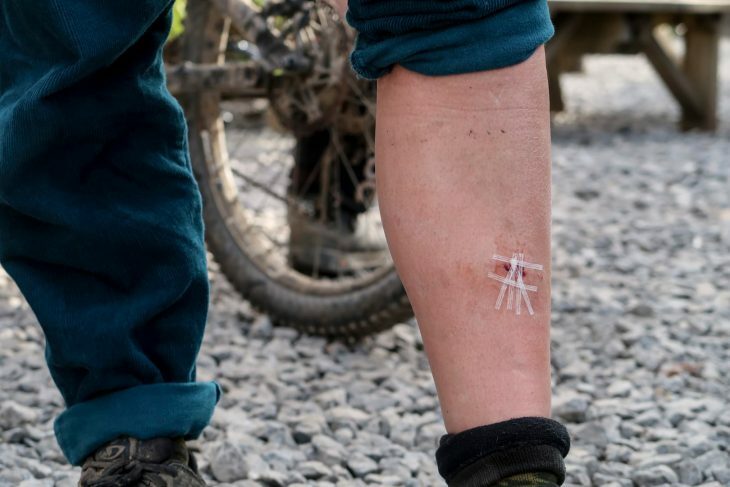 I’m a Chinese transgender lesbian with one eye and a wooden leg, would I be able to ride my mountain bike in Wales, or is this just for minority groups only?